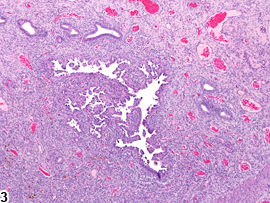 Uterus, Endometrium - Hyperplasia, Atypical in a female Wistar Han rat from a chronic study. The glandular epithelium projects into the glandular lumen (arrow), forming multiple thickened infoldings and projections. 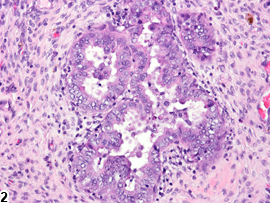 Uterus, Endometrium - Hyperplasia, Atypical in a female Wistar Han rat from a chronic study (higher magnification of Figure 1). There are multiple infoldings and projections of the endometrium into the uterine lumen. Uterus, Endometrium - Hyperplasia, Atypical in a female Wistar Han rat from a chronic study. The epithelium lining the uterine lumen projects into the lumen in irregular papillary fronds. 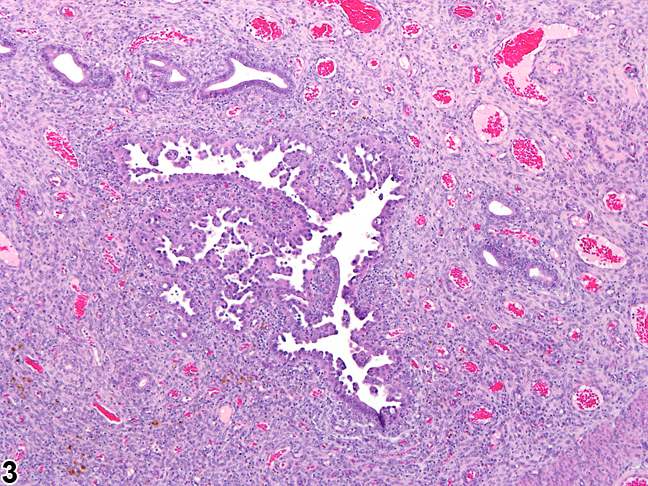 Uterus, Endometrium - Hyperplasia, Atypical in a female Wistar Han rat from a chronic study (higher magnification of Figure 3). The epithelial cells are irregularly arranged and exhibit cellular pleomorphism. 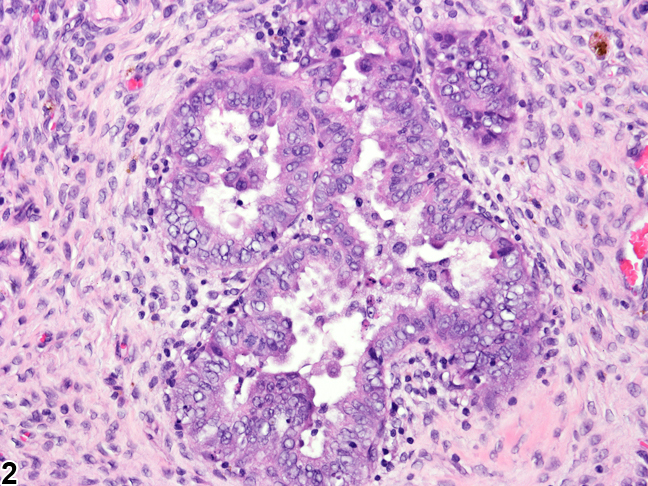 Uterus - Hyperplasia, Atypical in a female Harlan Sprague-Dawley rat from a chronic study. 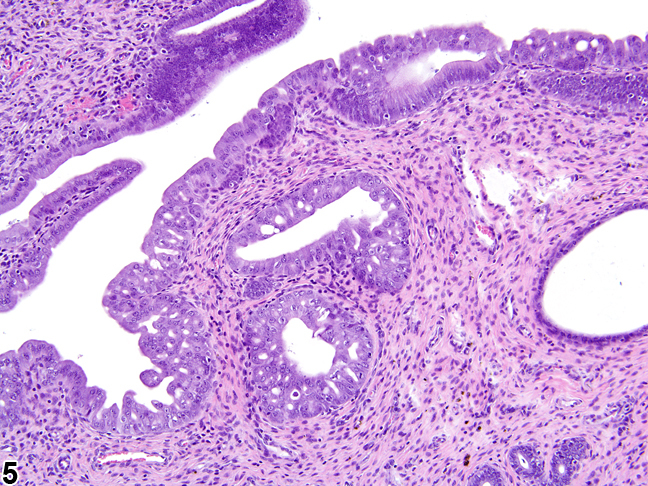 There is atypical hyperplasia of both surface and glandular epithelium. Atypical hyperplasia of the endometrium is more commonly seen in longitudinal sections of uteri in NTP studies because its most frequent location is in the proximal uterine horns near the bifurcation of the uterine body. 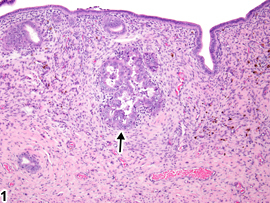 This lesion can affect both glandular ( Figure 1 , Figure 2 , and Figure 5 ) and uterine surface epithelium ( Figure 3 , Figure 4 , and Figure 5 ). 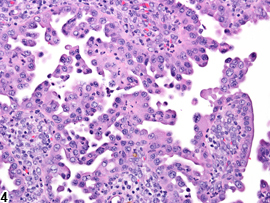 This lesion is typically characterized by clusters of enlarged glands separated by minimal amounts of stroma, though single glands can be affected. The affected glands are lined by a disorganized epithelium that may be up to six cell layers in thickness ( Figure 1 , Figure 2 , and Figure 5 ). 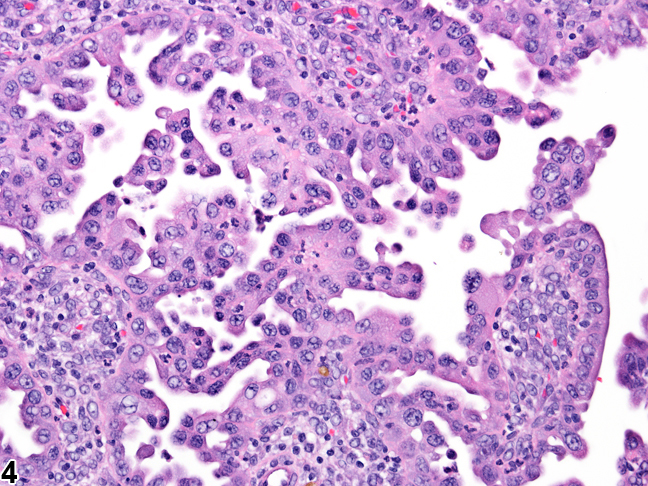 The epithelial cells of atypical hyperplasia often display loss of nuclear polarization, karyomegaly, mitosis, and cellular pleomorphism ( Figure 4 ). The thickened epithelium frequently projects into the glandular lumen, forming multiple thickened infoldings and projections ( Figure 1 , Figure 2 , and Figure 5 ). 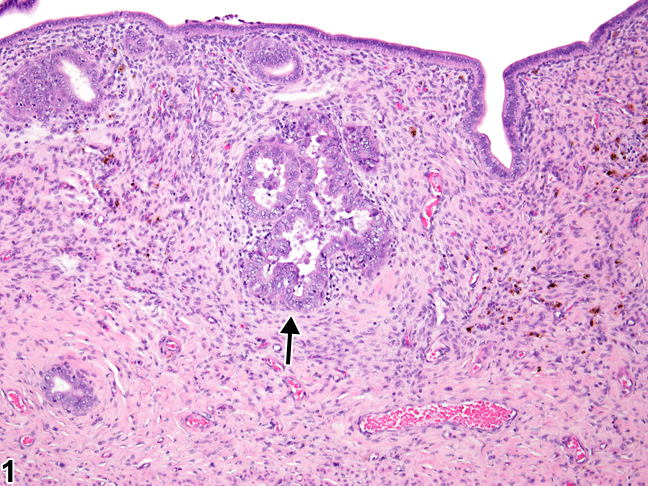 The papillary type of atypical hyperplasia affects the surface epithelium ( Figure 3 and Figure 4 ) and consists of numerous small branching projections of epithelium extending into the uterine lumen, occasionally on small fibrovascular stalks. In some cases, both the glands and the surface epithelium can be affected concurrently ( Figure 5 ). Atypical hyperplasia is differentiated from adenomas by the absence of compression and the fact that these lesions do not form a distinct mass. Uterus - Hyperplasia, Atypical should be diagnosed and graded whenever present. The location of the lesion, in glands or in the epithelium lining the uterine lumen, should be described in the pathology narrative. National Toxicology Program. 2014. NTP TR-587. Toxicology Studies of Tetrabromobisphenol A (CAS No. 79-94-7) in F344/NTac Rats and B6C3F1/N Mice and Toxicology and Carcinogenesis Studies of Tetrabromobisphenol A in Wistar Han [Crl:WI(Han)] Rats and B6C3F1 Mice (Gavage Studies). NTP, Research Triangle Park, NC.